How do you listen to a new Nick Cave album? He’s an icon. An obsession. A way of life. There’s so much to be parsed. So many statements to interpret. So many lines to read between. It’s a challenge. An exercise. An exam. How can you possibly enjoy it? It’s not music. It’s work. Well, if you’ve done your homework. If you’ve looked through all the past papers. If you take a big, deep breath. Then, you can get through it. The new Nick Cave album, the 15th with the Bad Seeds, is a tougher test than some. Murder Ballads was bloody, but still sort of fun. Dig!!! Lazarus Dig!!! was utterly bonkers. A great, raging, madness of the first logorrheic order. 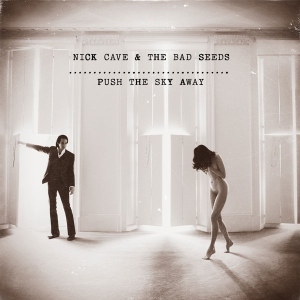 Push The Sky Away is a different beast altogether. The songs are slower, more downbeat, and curiously formless for the most part. He usually ends them after 3-4 minutes, but they could easily go on for twice as long. It takes at least three tracks before things start to get into their stride. By that time, we’re in fairly familiar Bad Seeds territory. Strong bass lines. Stories that are tawdry, going on seedy. But this is an album built around its two longest songs. The first, ‘Jubilee Street’, is the more conventional of the two. Lyrically, it tells an unsurprisingly sleazy story. Musically, it starts off in the same vein as many of the other songs, quietly, but builds up to a big finish. The real gem, though, is ‘Higgs Boson Blues’. For nearly eight minutes, it riffs on the essential nihilism of the Large Hadron Collider. Or something like that. The lyrics are pure Nick Cave. “Mama ate the pygmy, The pygmy ate the monkey, The monkey has a gift that he’s sending back to you”. No me neither. And then there’s the best pun ever, and one that US reviewers could easily miss, as Hannah Montana waits in the queue for the zoo loos. As he takes us from Geneva, to Memphis, an animal park somewhere, and Los Angeles, there’s no option but to follow, transfixed, mesmerised. Sometimes an album needs only a couple of great songs for the others to orbit around. This is one such album. It’s not a cakewalk. No multiple choice test. Nick Cave 101 is certainly not an easy option. But it’s worth it. Study hard, breathe deeply, and turn over the page. The Unknown Mortal Orchestra’s second album is not a quiet affair. ‘No Need For A Leader’ is a total Bolan glam-out. ‘Faded In The Morning’ has more than a touch of Physical Graffiti-ness about it. ‘One At A Time’ wears out the wah-wah pedal Hendrix-style. And throughout, there’s a sense that The Black Keys in all their rifftastic finery could be hiding just around the next corner. For some, the fact that they remain out of sight might be a major disappointment. A missed opportunity. A Grammy award-winning band wagon that was just waiting to be jumped on. But no. The opposite. What really works about this album is that even at its loudest moments, there’s a hush, a calm. It’s mainly in Ruban Nielson’s vocals. There’s never any screeching or hollering and they’re pretty much permanently disguised behind some-or-other technical device that brings them down in the mix. And then there are the slower, more laid-back tracks. It’s telling that the opener, ‘From The Sun’, gets things off to a relaxed start. Messrs. Auerbach and Carney would not approve. On ‘So Good At Being in Trouble’ there’s even a Matthew E. White feel to the sound. Sure, UMO come at things from a blues angle, but the skitteryness of the drums and the quietness of the double-tracked vocals generate the same sort of relaxed mood. The Black Keys are a great band, but we don’t need two of them. For their part, Unknown Mortal Orchestra have delivered a great album. We don’t need two of them either. But one will do just fine. Thanks. 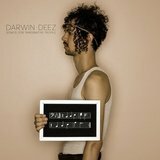 The first Darwin Deez album was a lo-fi masterpiece. With little more than a jumped-up beat box and a guitar, he delivered songs brimful of energy. What’s more, he managed to sound totally unique. Within a couple of bars, it could only be a Darwin Deez song. On his second album the palette is pretty much the same. There’s been some progression. It’s less of a lo-fi bedroom recording, more a lo-fi sitting room affair. But the thrill is still there. And some new-found anger. The gateway track is a pointer. Rather than gently welcoming you in, it erects a large sign saying ‘enter at your own peril’. Nervy, staccato, stop-start, ‘(800) HUMAN’ is the sort of track you’d preview in iTunes only to ditch as soon as the squall becomes too much. You’d be wrong. For all its rage at the start, half way through it becomes a totally different song. Quieter, gentler, hummable, enjoyable. And that’s part of the pleasure of a Darwin Deez album. For all the frantic scuzzy guitar of ‘Free (The Editorial Me)’, there are songs of real beauty, the final track, ‘Chelsea’s Hotel’, being the finest example. In every song, however discordantly it might start, something will grab you. Sometimes it’s the guitar. When it kicks in on ‘All In The Wrist’ the song goes to another place altogether. Sometimes it’s the lyrics. They’re among the driest around at the moment. Take this couplet from ‘You Can’t Be My Girl’: “You’re crazy and you show it off, Dear you’re slurring Gorbachev, You insist on discussing him, You’re so wrong but somehow you always win”. This is an album with some serious themes and some real indignation, but it’s not preachy. It may be a little less fun than last time, but there’s still real buzz to it. It’s difficult to imagine at such a remove, but this album represented a new Julian Cope. After the collapse of the Teardrops and two iffy solo albums, he was back. 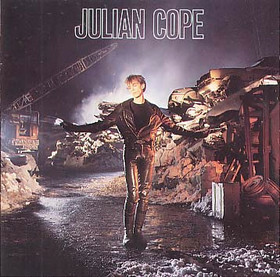 A cleaned-up, post-LSD, leather-trousered, rock god Julian Cope. OK, he did have a weird microphone stand thing going on, but that was just a gimmick. After the disappointment of the World Shut Your Mouth and Fried albums, Saint Julian was the fabled ‘return to form’. This was Julian Cope 2.0, before anyone knew what 2.0 meant. Great singles, ‘Trampolene’ and ‘World Shut Your Mouth’. Great album tracks, ‘Shot Down’, ‘Eve’s Volcano’. What could go wrong? Well, with the benefit of hindsight, we know all too well. Saint Julian was the high point of a solo career that didn’t so much go downhill as follow a series of rock’n’ roll ley lines to nowhere. But at least there was one great album in the can and now it’s been reissued with a whole extra disc of B-sides, remixes, and the rest. It’s dated pretty well. The drums are still annoying. Tinny and really high in the mix, they give some of the songs great pace, but they’re headache-inducing over 43 minutes. ‘Spacehopper’ sounds a little too juvenile now and ‘A Crack In The Clouds’ a little too serious. But most of the time the songs meet in the middle with great melodies and lots of energy. The extra disc is also worth a listen. ‘I’ve Got Levitation’, ‘Umpteenth Unnatural Blues’ and ‘Mock Turtle’ are well worth getting reacquainted with. It’s good to see Saint Julian back in circulation. After all, 1987 was a truly awful year in music. Strangeways merits a mention but even that was a bit of a disappointment. In less than two years everything would change for the better. And how. 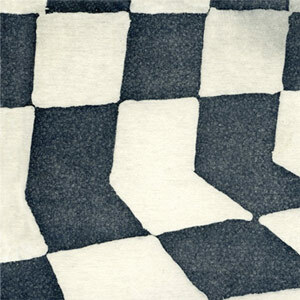 Ducktails is the side project of Matthew Mondanile of Real Estate. Side projects are inferior. By definition. Inherently. Genetically. But maybe not. The last Real Estate album, Days, was a nice listen. Did it stick in the memory? Not really. So what makes makes The Flower Lane different? In one sense, nothing. At a certain level, there’s not very much to distinguish the two projects. Both have lots of jangleness. Both have the same vocal sound. But they are different. Real Estate sound like they’re trying really hard. They want to be a serious band. Ducktails (listen, we just have to get over the silly name! ), by contrast, sound like they’re having fun. They sound like an 80s group, but with decent equipment and better production values to the power of n. There’s a real Blow Monkeys vibe at times. A little sax. Lots of guitars and synths and a great rhythm. ‘Assistant Director’ is nothing less than jaunty. And it may only be February (and only just) but ‘Under The Covers’ is going to be one of the great songs on the year. And just when you’re getting used to the vibe, there’s a real change. Towards the end, on ‘Sedan Magic’ and ‘Letter of Intent’, there’s a girl sound. The vocals are shared. It freshens up the feeling and adds another layer. Real Estate may be Matthew Mondanile’s long-term investment. The savings account. The pension fund. But Ducktails, in this manifestation at least, are the pure speculation. The short-term gain. And, even in these depressed times, sometimes it’s worth the risk. Ducktails are the day at the races. The thrill of the punt. They’re worth taking the chance.